Worse than they thought: Antarctica actually colder than scientists once believed | Watts Up With That? When the researchers first announced they had found the coldest temperatures on Earth five years ago, they determined that persistent clear skies and light winds are required for temperatures to dip this low. But the new study adds a twist to the story: Not only are clear skies necessary, but the air must also be extremely dry, because water vapor traps some heat in the air. The researchers observed the ultra-low temperatures in small dips or hollows in the Antarctic Ice Sheet. The super cold, super dry air is denser than the slightly warmer air around it, so it falls into the hollows and becomes trapped. This allows the snow surface and the air above it to cool further, until the clear, calm, dry conditions change and the cold air mixes with warmer air higher in the atmosphere. “In this area, we see periods of incredibly dry air, and this allows the heat from the surface of the snow to radiate into space more easily,” said Ted Scambos, a senior research scientist at the National Snow and Ice Data Center at the University of Colorado-Boulder and lead author of the new study in Geophysical Research Letters, a journal of the American Geophysical Union. The record of minus 98 degrees Celsius is about as cold as it is possible to get at Earth’s surface, according to the researchers. For the temperature to drop that low, clear skies and dry air need to persist for several days. Temperatures could drop a little lower if the conditions lasted for several weeks, but that’s extremely unlikely to happen, Scambos said. 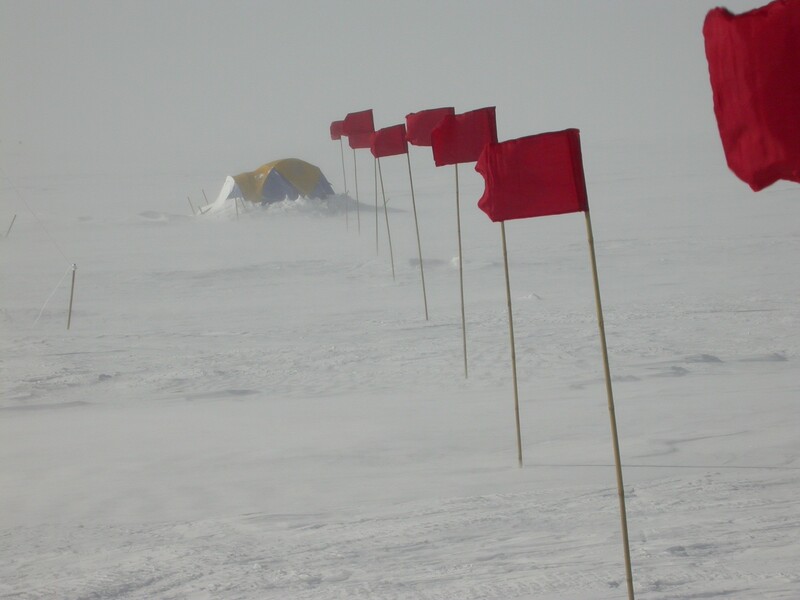 Blowing snow conditions at a camp site near Vostok Station in Antarctic summer. Credit: Ted Scambos, NSIDC/University of Colorado-Boulder. The high elevation of the East Antarctic Plateau and its proximity to the South Pole give it the coldest climate of any region on Earth. The lowest air temperature ever measured by a weather station, minus 89 degrees Celsius (minus 128 degrees Fahrenheit), was recorded there at Russia’s Vostok Station in July 1983. But weather stations can’t measure temperatures everywhere. So in 2013, Scambos and his colleagues decided to analyze data from several Earth-observing satellites to see if they could find temperatures on the plateau even lower than those recorded at Vostok. In the new study, they analyzed satellite data collected during the Southern Hemisphere’s winter between 2004 and 2016. They used data from the MODIS instrument aboard NASA’s Terra and Aqua satellites as well as data from instruments on NOAA’s Polar Operational Environmental Satellites. The researchers initially saw a broad region of the plateau more than 3,500 meters (11,000 feet) above sea level where temperatures regularly dropped below minus 90 degrees Celsius (minus 130 degrees Fahrenheit) at the snow surface. The lowest temperature they observed was minus 93 degrees Celsius (minus 135 degrees Fahrenheit). Data from the MODIS instruments is calibrated using temperature measurements from weather stations on the ground. In 2016, NASA recalibrated the MODIS data with more up-to-date weather station measurements, and the researchers reanalyzed the temperature data. The weather conditions on the plateau did not change, but the adjusted satellite data gave the researchers a more accurate picture of what the actual lowest temperature was. 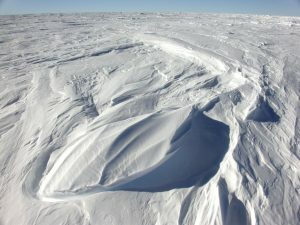 Persistent winds shape the surface of East Antarctica’s snow into small dune forms called ‘sastrugi’. Scambos and his colleagues analyzed the terrain where they saw these ultra-low temperatures and found they occurred in small hollows 2 to 3 meters (6 to 9 feet) deep in the surface of the ice, on the southern side of high ridges on the plateau. Interestingly, the researchers noticed a whole cluster of places where temperatures plunged almost exactly to that record low over the 14-year period, even though they were located hundreds of kilometers apart. That got them wondering: Is there a limit to how cold it can get on the plateau? For the temperature to drop to that record low, skies must be clear and the air must be bone-dry for several days. After the temperature drops below a certain point, the air cools so slowly that it can’t get perceptibly colder before the weather conditions change, according to the researchers. Minus 98 degrees Celsius, then, appears to be the limit to how cold it can get at Earth’s surface, Scambos said. “There’s a limit to how long the conditions persist to allow it to cool to these ultra-low temperatures, and a limit to how much heat you can actually get through the atmosphere, because water vapor has to be almost nonexistent in order to emit heat from the surface at these temperatures,” he said. June 25, 2018 in Antarctic. Pesky details like this should not get in the way of Jerry Brown’s political moments orchestrated to capture cap and trade dollars and high speed rail spending. Just waiting for the paper claiming that Global Warming is altering the Antarctic Polar Vortex to the point that drier winter conditions prevail longer making Antarctica even colder. I have a model they could use if they want to. That is cold! If you dig a small well into ice and place dry ice (solid CO2) into bottom of the well it stay there quite long. In fact I believe solid CO2 will condense out of the air at that temperature. Now we know why increased CO2 has had no warming effect over Antarctica! But what about during the summer? Surely it must warm the South Pole then. Yes, CO2 will condense at that temperature, but not out of the air. It must have a lot higher partial pressure to condense. The air (78%N2-21%O2-1%Ar) becomes CO2 saturated, so it “frosts out” as a solid releasing heat preventing further cooling. There already is almost 0% water vapor in that air. depends on pressure. To turn solid, you need ~0.16 bar for this -98°C temperature. Did you notice that the article did not mention CO2? I don’t think it mentioned global warming or climate change. It didn’t say we have to research this rare and precious phenomenon now because our grand children won’t know what extreme cold is. I’m going to mark this day on the calendar. In a previous guest contribution ( https://wattsupwiththat.com/2017/04/23/the-meaning-and-utility-of-averages-as-it-applies-to-climate/ ) I made the claim that the probability distribution function for annual Earth temperatures was not normally distributed. Indeed, it appears to be highly skewed. This article provided by Anthony makes it appear that the tail of that distribution is even longer than I suggested. Climate data are almost never normally distributed. For one thing they are almost always strongly autocorrelated. And from a strict mathematical viewpoint temperatures can never be normally distributed. The normal distribution function is defined from minus infinty to plus infinity, so no variable that has a lower limit (like temperature) or upper limit can be normally distributed. Again more data and analysis confirming we clearly don’t understand the Earth’s weather and climate as well as some would have us believe. What I got out of this is that when it’s really cold, it’s a cluster…. The Antarctic has the prominent role in influencing the temperature anomalies that are produced. A not very widely known property of frozen di-hydrogen oxide is that it remains solid when the temperature is below zero Centigrade. My ice skates say that’s incorrect. In other words, you failed to define a pressure. The temperature at Concordia station regularly drops to -70 C.
Look at the bright side, that is cold enough to freeze out the CO2 which means no more Global Warming Climate Change in the Antarctic! No. For CO2 to condense at that temperature it has to be at a vastly higher partial pressure than it is in the atmosphere. It would need to be about 10% rather then 0,04 %. At a partial pressure of 0,0004 atmospheres CO2 will condense at about -135 C.
As a curiosity solid CO2 can exist at 0 C and about 1000 atmospheres, so if the Marianas trench was just offshore Antarctica (where the deep water is at least locally at -2 C) there might be solid CO2 at the bottom. Actually, CO2 will freeze at that temperature and partial pressure but it will also sublimate at the same rate so there would be no net accumulation. However, if we keep the CO2 molecules busy in that freeze/sublimation cycle they will be too busy to do their Global Warming Climate Change thing. To be fair you are in good company; even Lief used to believe that until he was schooled right here at WUWT. Actually, a CO2 molecule can freeze out at that temperature, the problem being that it can also sublimate at that temperature and partial pressure, so that there would be no net accumulation of solid CO2. Still based on the CO2 Distraction Theory (CDT), that would be enough as the poor little CO2 molecules would be so busy freezing and sublimating that they wouldn’t have time to cause Global Warming Climate Change. Aplologies to Dr Leif Svalgaard for the incorrect spelling of his name above. I can hardly believe it – a sensible decision made by politicians! It must have been very hard to overcome the pleading of the Greenies and others who would have benefited from the cash flow from this project. Well done! Excellent news; it was a potty idea, the costs (environmental & £) outweighed any benefits. I know the Bristol Chanel / Swansea Bay area well, without constant dredging, silt would have stopped it in 50 yrs. We should use Appropriate NOT any old Alternative energy. But I’m just an engineer…so what would I know. So is CO2 freezing out of the atmosphere at these spots? My thought exactly! There must be widespread areas below -78. We are missing several Gigatons of emitted carbon after all! Just think how easy it would be to set up a nuclear powered CO2 extraction plant, highly efficient at that ambient! Oh the subsidies… I think I need to lay down for a while…. The stratospheric polar vortex cuts off the flow of water vapor over the polar circle in the winter. That’s why noctilucent cloud appear in the mesosphere in summer at high latitudes. In the Antarctic winter, in effect the stratosphere descends to the surface. So the sky really does fall? 🙂 Does it make a noise when it hits the surface? Only if there is someone there to hear it! In the Antarctic winter, in effect the stratosphere descends to the surface..
No it does not. Like you I used to think that, but Fig 1. in this paper by Pan, W et al. 2002 The temperature structure of the winter atmosphere at South Pole clearly shows the presence of a winter tropopause at an elevation of 8km at the South Pole and below that height the temperature increases towards the surface (until the near surface thermal inversion layer is reached). So even in winter the ice surface of East Antarctica at the South Pole is still in the troposphere. A comparative study of atmospheres on other worlds has shown that a planet’s tropopause is determined by atmospheric pressure rather than air temperature. See Robinson, T.D. & Catling, D.C. (2014) Common 0.1 bar tropopause in thick atmospheres set by pressure-dependent infrared transparency. I did say, “in effect”. In terms of T, and to a lesser extent, air pressure and H2O content, it’s similar to the stratosphere. Didn’t mean it literally. These cold spots are at high altitudes where the air pressure is about 2/3rds sea level, but it is awfully cold. Will it snow CO2 at those levels? No, because the CO2 is not at one atmosphere pressure. In the same way water vapour in the atmosphere won’t automatically condense whenever temperature drops below 100 C.
Air contains a few molecules other than CO2 so partial pressure of CO2 is a bit less than one KPa at Sea Level and ~30% less still at 3500 metres. So no deposition of CO2 at183 K.
what about at 175 K? The contour interval is 5 °C. Perhaps not at sea level in the tropics. Curious what the very low RH% was, and the cutoff % to inhibit going to extreme cold. Didn’t see anything in the PDF. So if the CO2 in our atmosphere doubles, and then doubles again, and then doubles again, and so on…, the Antarctic ice will melt and drown us all. Oh the horrors! Yes in a few places liquid water can be found flowing on the ice cap. Antarctic temperatures maybe well below freezing nearly everywhere nearly all of the time, but it doesn’t hold everywhere. Nansen Ice Shelf floats at sea level. And at about 75 degrees S.
Yes, there is a little liquid water here and there in Antarctica. I once had an unfortunate experience with some of it. I was wading across a small rivulet on Deception Island where geothermal heat melts snow locally, but slipped on the ice-covered bottom and sat down in the water which was decidely unpleasant at 0 C and about 30 mph wind. Normally rivers freeze from the surface down, but this one was running over permafrost and was freezing from the bottom up! And for an even odder case of liquid water in Antarctica google “Blood Falls”. Kept waiting for an actual humidity reading but no luck. We ‘ll just call it incredibly dry. It is so dry that it has been seriously suggested that an (unmanned) infrared observatory in central East Antarctica would be a viable (and cheaper) alternative to a satellite IR telescope. Almost no water vapor and as we know that is the important GHG, there isn’t enough CO2, CH4, Freon etc etc to seriously degrade performance. Why unmanned? Because humans produce too much heat. You might get a grant from the Trump Administration. Please write up your proposal. Humans not only produce too much heat, but would need heating to survive in the Mars-like conditions. Now maybe the altitude makes the pressure to low? Tony may deserve a belated apology. I thought he was wrong at the time with all the high-powered criticism, but I was intrigued by the possibility that during the glacial max when it was really cold – that is precisely where all the CO2 goes! Now that would revolutionize long term climate science. It explains the first temperature rise giving such an abrupt appearance of abundant CO2. I was always troubled by the idea that massive outgassing of the oceans could be the cause – that is a much more subdued phenomenon. Air pressure at 10,000 feet is 10.1 psi, v. 14.7 at sea level. Sigh. It is the CO2 that needs to be at one atmosphere. It is currently at 0.0004 atmospheres which means that it won’t condense until -135 C.
Steve Goddards claim is equivalent to saying that the water vapor in the atmosphere will condense whenever temperature goes below 100 C.
Tty My point is that during the glacial max 30,000yrs ago it was probably much colder than now. Co2 pressure on mars is 6mb and it doesnt appear to be only marginally subliming. Winter at the poles is only some -125C on Mars. Also, as the sublimation begins, CO2 is pulled from equatorial and ‘temperate’ zones to the ice cap (trying to maintain its global atmospheric distribution) so its not just a local source for the co2. Think globally, not locally to invert the homily. Moreover, if we know the max volume of the Martian icecap, we can calculate how much the Co2 partial pressure can be reduced to before its sublimating accummulation stops! Finally, weve had estimates up to 9000ppm in geological history and ice ages at least 1/2 billion years ago so this process has most likely been part of our atmospheric history. Last Glacial Maximum ice peak was about 26.500 years BP. 6 mb and -125 C is just about at the sublimation point for CO2, and the frozen CO2 at Mars’ poles does partially vaporize in summer. Without the stabilizing effect of a large moon and with a more elliptic orbit Milankovich effects are much stronger on Mars. The peculiar layered terrain in the polar areas is almost certainly due to Milankovich-caused CO2 “glaciation” and “deglaciation”. Mars is currently in an “Co2-ice-age”. These “climate scientists” are just figuring out something I learned working, living, and sleeping in cold environments long ago! The coldest or coolest air pools in the bottom of depressions, draws, or valleys in in calm conditions. Anyone that has done much living outdoors in what most would consider extreme conditions knows this because it becomes particularly noticeable in very hot and cold environments and one has to factor it in when picking a site to rest or stay. The colder or hotter the conditions one is working in the more difference knowing such fundamental things makes in preventing heat and cold injuries and taking care of the general welfare of the group. I really have to shake my head sometimes when I read of “discoveries” like this. For once I must defend climate scientists. I have no doubt that they are well aware of the phenomenon, any meteorologist is. The question in this case was how cold it can get in those hollows up in central East Antarctica. Then if they were going to be searching for the absolute minimum temps on earth the depressions at altitude would be the place to do it. But they didn’t do that now did they! Nope! In fact the article is written with a tone of some surprising result. I’ve read the actual paper and I fail to see any such tone. There is an ironic twist though, they note that even lower temperatures are probably impossible, becase at below -75 C the IR emission spectral peak shifts into a band where CO2 is an effective absorber…. Not just outdoors. The air is coldest in a tent at the bottom. The kids in the huts at Valley Forge who slept in the highest bunks survived and those in the lowest froze. ho hum. I’ve always thought that the best place to test the CO2 warming conjecture is in the deserts where water vapour is sufficiently low and CO2 predominates. but curiously climate science seems to skirt that simple idea. Yeah-the daily temperature range in a desert on a dry day can be huge. I’ve always thought that with very little water vapour there was nothing to hold the heat of the day. Cold after the sun goes down. Not enough CO2 to hold any heat. Its been some time since I heard anyone use the expression “bone dry”. Wow. If they run this analysis in another 5 years or so, no telling how cold it’ll get. Another way of looking at it: the difference between the “coldest ever” and our current “global temperature” (snicker) has gotten larger – IT’S WORSE THAN WE THOUGHT! Yup. As long as there are bucks in CACA, the spin will be that global warming is making Antarctica colder! Where is Tisdale and his cold related adjective? It’s not that these “super cold, super dry air” dips get deeper. and stacks the ice shield higher ’round the dips. No. Read the paper. The (shallow) hollows get colder because the air there gets trapped and doesn’t flow downhill towards the coast as it gets colder and heavier. These are the infamous katabatic winds that have caused the coasts of East Antarctica to be called “the home of the blizzard”. Precipitation is extremely low everywhere in inland East Antarctica. I did get a chuckle at this understatement. “Data from the MODIS instruments is calibrated using temperature measurements from weather stations on the ground. In 2016, NASA recalibrated the MODIS data with more up-to-date weather station measurements, and the researchers reanalyzed the temperature data. The weather conditions on the plateau did not change, but the adjusted satellite data gave the researchers a more accurate picture of what the actual lowest temperature was. Having done considerable instrument calibration work over 35 years, I find this description problematic. It sounds as though the researchers applied new 2016 calibration results to data taken in earlier years. Presumably the instruments had been calibrated in some previous time. Maybe several years earlier. A serious problem arises when a recalibration of an instrument shows it is no longer within normal tolerances. That is, trying to determine when it changed and whether or not previously recorded data is valid. Was the change a gradual linear drift? Did it start right after the previous calibration or only recently? Was the previous calibration just not done correctly? When this issue arises, as it sometimes does in critical laboratory measurements involved in litigation, it is not uncommon to simply declare all measurements made between calibrations invalid. In many cases there is simply no way to prove convincingly that data can be corrected for the error discovered. One must also ask, was this 5C error in MODIS measurements of temperature also present in all the other temperature data collected in the previous years? Will it be necessary, or indeed possible to correct that data as well? If you go look at the CO2 phase diagram, you’ll note that CO2 is hitting the depositional line (phase change gas to solid) at that temp (-98 C) and pressure (11,000 feet). No it doesn’t. That phase diagram is for pure CO2. At the very low partial pressure in the atmosphere it won’t condense until -135 C.
However if you put a slab of solid CO2 there it would evaporate very slowly if it was windless. Some CO2 would evaporate and since it is heavier than air it would accumulate locally and raise the partial pressure. However even a breath of wind would disperse the CO2 cloud and speed up evaporation. The cooling of the atmosphere is influenced by the increase in the amount of O3 and 14CO2 in the lower stratosphere, because it causes a decrease of water vapor in the tropopause. 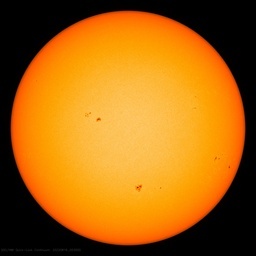 Therefore, the temperature in winter during low solar activity must fall. How can there be no water in the air where these low temperatures have been recorded? The whole interior of the continent is buried in ice! Something tells me neither Nasa GISS nor Cowtan & Way of ‘Best’ are clamoring to add that temperature extrapolation into their temperature reconstructions. So they admit that even fairly small quantities of water vapour have a big effect? Now if they just model that correctly the CO2 thing should disappear forever and water will become a pollutant! If mankind fails to take action soon, then eventually the maximum low temperature will be only 96 degrees C.
Which put new perspective on alleged 0.6°C global warming over the last century. It also intimates that if the Arctic was a similar sized land mass with 11,000 meter altitudes, that the Arctic would be equally cold. Which suggests that alleged 0.6°C CAGW warming or even 6.0°C CAGW warming barely affects Arctic or Antarctic temperatures. Joe Bastardi regularly points out that Global Warming claims rely upon sparse polar temperature measurements. That global temperature increases are dependent upon warming during Polar winters, not evident during Polar summers, and most evident during night, due to water vapor levels. Not to worry it will be better than two degrees F warmer in another hundred years or so. Not only are clear skies necessary, but the air must also be extremely dry, because water vapor traps some heat in the air.